Joe, Heather and I attended the Fancy Food Show recently and were tempted by all the tantalizing new flavors and products. Rubs, marinades, spice blends…FLAVOR was everywhere! A particular standout were the offerings from Saucy Mama, maker of marinades, dressings, sauces and mustards. We sampled some of their popular items such as Lime Chipotle Marinade, Sesame Ginger Dressing, Cracked Pepper Marinade and Chipotle Mustard to name a few. They were all chock full of zest, spice, and character. Saucy Mama’s motto is Make Every Meal Extraordinary, and that is just what we decided to do. 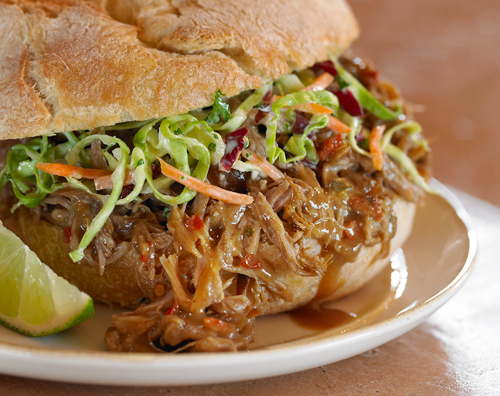 We took Saucy Mama Lime Chipotle Marinade, combined it with pork, barbecue sauce and brown sugar, tossed it into the slow-cooker and created a fantastic Pulled Pork recipe. It is a little bit sweet, a little bit sour and a lot spicy hot!!! – Place pork roast and onion in large slow-cooker. – In small bowl, stir together Lime Chipotle Marinade, barbecue sauce, brown sugar and 1/3 cup water. Pour over pork. Cover and cook on LOW 8-10 hours. – Remove pork from slow-cooker. Using a knife and fork, pull meat into shredded pieces. Place shredded meat back into sauce in slow-cooker and stir. Keep warm until ready to serve. – Divide pork mixture evenly between split rolls; top with cole slaw. yum… this is making stomach so hungry! That is one beautiful sandwich! My hubby will LOVE this! Mary, thanks for the compliments! Love your blog’s name, and am going to try one of your Nutella cookie recipes. Yum! I made some pulled pork the other day but it looked nowhere near as awesome as this. I think you’ve officially pulled me out of my vegetarian phase with this. Awesome. I know, really tempting image shot by Joe…. We’ll try to do some veggies soon to get you back on track! Pulled pork and coleslaw? Win! Goodness, this meal looks like it’s worth the 5 napkins that it would take to eat it. Any tips? Well, always think it is a good idea to have a fork nearby when eating pulled pork sandwiches—that way you do not miss a bite! P.S. Ever eaten at 5 Napkin Burger in NYC? Awesome! Pulled pork is my Kryptonite. Yum! I would love to try this, where can I buy it? Love to cook pork roast on my Big Green Egg and always need a flavorful sauce. This sounds like the perfect item to bring to the BBQ at my husband’s family reunion this May! That will show my mother in law! Ha-ha! Saucy Mama’s products are available via mail-order at http://www.baryte.com and on Amazon.com. You can order Saucy Mama’s products by mail at http://www.barhyte.com and on Amazon.com. Have fun at the reunion! mmmmmmm PORK! My weakness! Where can you find Saucy Mama products? I would love to try a recipe with the Asian Ginger marinade! Any suggestions? Why not marinate thinly sliced pork, then stir fry it in a little sesame oil with sliced green onions and 2-inch pieces of spring asparagus? Serve over brown rice. Hmmm. Now I’m hungry just thinking about that!